The lovely number four in our top ten list is the Margarita. Tequila isn’t found in so many of the older classic cocktails, and apparently while the Margarita has existed since the 30s (or 40s or 50s, depending on which origin story you roll with), it didn’t become well known until the groovy 70s. It’s a very simple recipe that is in the same sours class as the Daiquiri and the Sidecar. There are a few things to play with in a Margarita: the type of tequila, sweetener, and ratio of ingredients. If you are wondering where the fruit is, we have lime, but that’s it (and please use fresh-squeezed juice). I’m talking about real, classic Margaritas, not the slushy, fruity drinks that are based on the original Margarita. Let’s break this classic down. A lot of people either love or hate tequila. Often this is driven by how sick you got from it in college. I love tequila. Once I had an aged tequila my whole understanding of tequila changed for the better. You really do want to get a true 100% agave tequila. Also, no worms, OK? That’s veering back towards college. Leave that behind, my friend. The agave is a wonderful spiky-leaved succulent plant that thrives in Mexico. Specifically tequila is made from the blue agave plant in the Jalisco area of Mexico. Tequila is actually a specific variety of mezcal, which is a larger class of agave-based liquor. I think it is fair to assume that people have been making fermented beverages with agave for a very long time. The Spaniards are the ones that introduced the idea of distilling that in the 1500s to make what has eventually become tequila (and mezcal) today. These days, when you are looking for Margarita tequila, you will most often see recipes call for silver (plato) or white (blanco), which is an unaged tequila. There are also several levels of aging, reposado, añejo, and extra añejo. (Joven or gold varieties are a blend of unaged and aged, or sometimes even just colored unaged tequila.) There is a great article over at KQED’s Bay Area Bites on A Short Guide to Tequila and Making a Great Margarita that gets into more detail. As they sum up, “blanco will give your margarita more of a true agave flavor while reposado is for those who want a smoother taste.” Añejo is really more of a sipping tequila in my bar. For my Margarita tasting, I have one silver, Herradura, and two reposado, Centenario and Don Julio. The classic sweetener for a Margarita is triple sec. Many times Cointreau (a brand of triple sec) is specified. The orange in the liqueur plays well with the lime juice. Other sweeteners can be used though, most notably just using a syrup instead of a liqueur. Simple syrup is an easy standard bar ingredient you can make at home (just heat equal parts sugar and water until the sugar dissolves). Agave syrup is made from the same plant as tequila, so the flavors marry beautifully in tequila cocktails. One thing to note is that when you use a syrup instead of a liqueur, you won’t need as much of it because the syrup will be sweeter. So, if you use syrup with a recipe that has liqueur, just start small and taste it or you could end up with an overly sweet drink. Shake it up in a mixer, strain, and serve it up. You can of course serve it on the rocks if you prefer that the drink dilute a bit over time. The salt on the rim is also very optional. I go about 50/50 on that, depending on my mood and if I’m craving salty. Generally, at home I don’t bother. One thing to note is that salt in a drink with fruit juice can enhance the sour aspect. That can be really great, depending on what you want. With the reposados, the Don Julio isn’t so strong as the Centenario. The Centenario has a solid, distinct tequila taste. 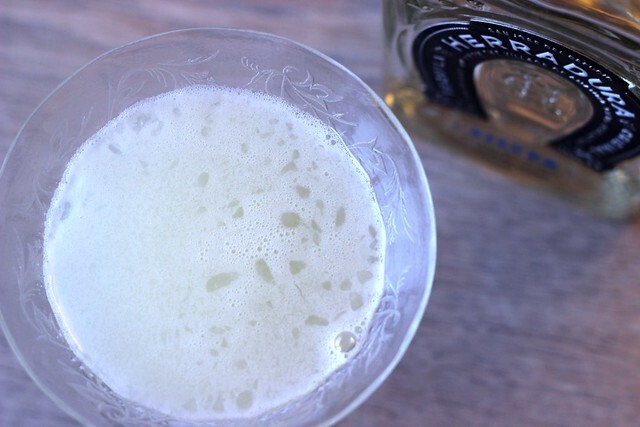 The difference between the Don Julio reposado and the Herradura silver is actually quite subtle. The Don Julio is very nice, but I don’t think it’s worth the expense to use it in a Margarita, and I’ll stick to that as a sipping tequila. 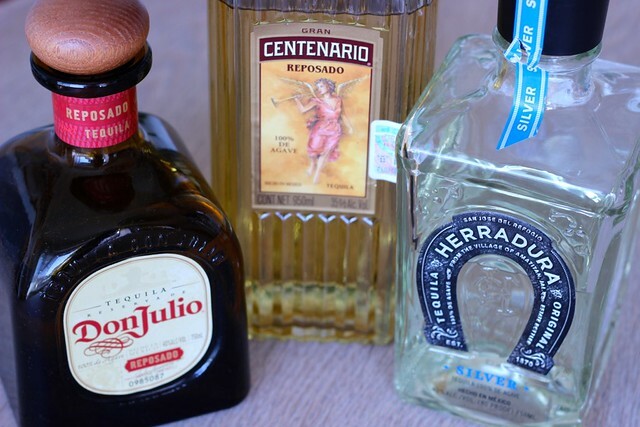 I like the Centanario flavor but overall I think I’d actually stick with the Herradura silver. For sweeteners, both the agave and the triple sec bring really nice flavor. The hint of orange in the triple sec is most noticeable in the Herradura. The agave adds a really great roundness to the drink though, which I really quite like. Next time I’ll have to try a 50/50 triple sec/agave mix.